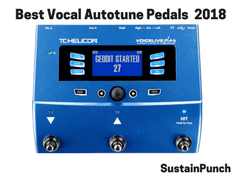 What are the best live autotune pedals for vocals in 2019? Well in this blog, that’s exactly what we’re going to talk about. Firstly, let me say that I’ve been wanting to write this blog for years! I’m a huge fan of using live autotune pedals, autotune hardware & autotune machines (whatever you decide to call them) because I believe they give a polished studio sounding live performance, which is exactly what a live audience wants to hear… Fantastic vocals and a stage performance to be captivated by. Firstly, for those who aren’t familiar with the concept of pitch correction & autotune, they are essentially the same thing. Autotune is a vocal effect, used to enhance the pitch accuracy of singer’s vocal take. This was initially achieved in-studio by the studio engineer, to clean up a vocal take for professional singers who needed that slight nudge in the sharp or flat direction. However, with the likes of T-Pain and other artists taking advantage of high velocity, turn up the volume, pitch correction. This extreme robotic sound became what people formally know as autotune. In recent years, autotune has been more widely used in live performances through the integration of vocal effects pedals. All kinds of music artists/bands use the autotune effect including, Taylor Swift, 30 Seconds To Mars, Boys Like Girls, 5 Seconds of Summer… you get the idea. So, what are you waiting for, if the best artists in the music industry are using them, maybe you should too. Now, you may be thinking, I just want this pedal for slight pitch correction, or I want this pedal for the extreme robotic sounding effect. Each of the pedals I have reviewed offer both functionalities, as the primary difference between the two functions is the speed to which the effect takes place, and the level to which it is heard. So, without further ado, buckle up and get ready to see the best autotune microphone pedals in 2019, we also have a review of the best autotune microphone controllers, I.E Microphones that are able to control and switch between pedal presets, directly on the microphone. We have also featured the Art Autotune Tube device, which is available on Juno.co.uk. It has been discontinued, which is why we have not featured it within the table above, despite this, it is a fantastic device and we have reviewed it. Been around for nearly 10 years, some might say the hardware is outdated. 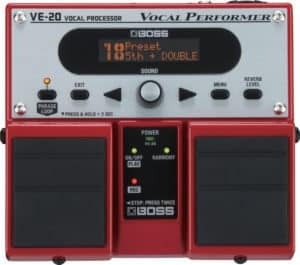 The BOSS VE 20 Vocal Performer is not primarily a vocal pitch correction pedal, it’s essentially an All-in-One vocal effects processor solution, and being designed and produced by Boss, you know it’s high quality. Being 1.6kg it’s not the lightest pedal in the world, but it more than makes up for it in its ability to add layers of vocal harmonies, whilst adding creative vocal effects such as radio effect, strobe and distortion effect. It allows singers to also use real-time pitch-correction, which is highly important, to make sure the vocal harmonies are in tune with the lead vocal. Also allowing 38 seconds (mono) of looped recording, which is useful for singer-songwriters looking for a creative, innovative way to build up their song’s live instrumentation, layer by later, directly in front of their crowd. The pedal also includes Phantom Power, so it is able to power condenser microphones, such as the Rode NT2A. Not Battery Operated. But it shouldn’t be because it offers so much functionality. Batteries just wouldn’t cut it. The TC Helicon VoiceLive Play is a multi-effects pedal, combining multiple vocal effects/tools in a medium sized device. In my opinion, this device offers a singer everything they need within a vocal pedal. Let’s go more into detail! This pedal is truly an all-in-one vocal solution in every way. It not only includes Live Pitch Correction, but it includes many other vocal effects including Delay, Reverb, Harmony, Doubler, Tone, Transducer. These vocal effects will keep you occupied for a good long while. The processor offers 200+ Artist and Song inspired presets, to give you iconic sounds that you can adopt for your live performances. The pedal includes a great, built-in microphone, which constantly monitors the key of the song in order to provide accurate pitch correction/harmonies. The VoicePlay offers users the ability to access and monitor several vocal aspects, including longest note, trouble notes and pitch accuracy. This consistent monitoring can help you improve your ability as a singer, identifying the areas/notes that you need to improve on. This is a fantastic function that we wish all of the vocal pedals featured. The TC Helicon VoiceTone C1 is part of the voice tone range, which consists of Vocal Harmonizer Pedals such as the VoiceTone H1 and Vocal Reverb Pedals such as the Voicetone R1. The VoiceTone C1 is dedicated entirely to vocal pitch correction. The TC Helicon live autotune pedal has three rotary knobs on the front, controlling the ‘key’, ‘severity of tuning’ and ‘gender’. The key refers to the musical key that the song is being performed in. The VoiceTone C1 also provides a CH option, which allows the user to plug a guitar/piano in (via 1/4” jack) and dictate the vocal key from the secondary input. This is especially useful for songs which include key changes, since a song may change from key C to D, this means that the C1 would pick up the key change from the chords of the secondary instrument and make the appropriate pitch correction adjustments. Finally, the C1 can be integrated with the TC-Helicon MP-75/76 microphone, the advantage of using this microphone is that it has a built-in control switch button, which remotely turns the VoiceTone effect pedals on/off. This means that you’re not restricted to one area of the stage, which is excellent for singers who are playing without an instrument. For a real look, please refer to the demonstration video, The first video is of me singing, whilst using the C1 pedal on a subtle setting, since I couldn’t find a good video, demonstrating the capability of the device for singers looking for a minor correction. High Quality – Rackmount processor, including a microphone pre-amp, de-essing, eq, mono and stereo double-tracking, microphone/tube modelling, gating, compression and Antares Auto-Tune™ pitch-correction. Saveable presets for quick switching between autotune effect combinations. Tube Modelling gives functionality to emulate other microphone characteristics. Although this can be quite easily transported, it’s not as small as other autotune processors. The Tascam TA-1VP as co-created by Antares Audio Technologies and features the most successful ‘Auto-Tune™’ software. This processor is the ideal autotune/pitch correction solution for any singer who’s looking for a high quality autotune device for live performances, as well as in the studio. After all, this is a rack-mountable autotune processor and has a range of different functions available, including the ability to save different vocal presets, which can be switched between on the front of the unit. The device has a range of additional functions, including Microphone Modelling, Compressing, Gating, De-essing and Equalisation (EQ). This is the only rack-mountable autotune machine, that has the integrated ‘Antares Autotune’ effect, which is able to provide realistic live pitch correction, and correction for studio use. Buy On Juno – This device has been discontinued, but I’ve done some research and Juno sell it for a great price. Need to purchase a foot-switch to use effectively on stage – check here for the best price. Now firstly, this is a hard autotune pedal to come by. Almost no stores sell them! Which is crazy, but also extremely nice to know because it has been, until now my secret weapon. But now it’s time to share with all you singers! The reason I say it was my secret weapon is because it offers so many advantages over the other featured vocal pitch correction pedals. Firstly, those who are familiar with studio autotune, realise that Antares is the go-to company who provide the best, industry standard vocal autotune plugins for recording studios and live sound. ART & Antares have teamed up together to create the Auto-tune Pre Tube Preamp, which runs Antares Autotune®. A highly affordable option, subsequently eliminating the need to have a laptop/computer setup at a live show to gain the professional Antares autotune sound. Instead, this device just needs mains power to run. This highly portable autotune processor includes ART’s 12AX7A valve circuit, to add a warm character to the signal path alongside the ‘vectorial’ optical compressor. The result of this professional design gives signers the to use this in both a Live & Studio environment. The device offers 48v Phantom Power for condenser microphone powering and includes a low-cut filter to get rid of unwanted bass frequencies. As well as a +20dB gain switch. The devices also features Gain Reduction, Tube Drive and an Output Level to make sure that you have the optimal output signal strength. Secondly, the main problem I’ve found with the majority of auto tune pedals is that they only provide a limited amount of control functions. I mean this in the way that you may select a musical key, but the song may not include certain notes within that key, therefore adding variables of uncertainty if you were to go off key in the wrong way. The ART Auto-tune Pre Tube Preamp solves this problem. It allows for the user to manually control several parameters, including selecting a musical key, then further specify the notes that should be put in/taken out, all represented in a visual, user-friendly way on the front panel of the device. This is the ultimate selling point for singers who want to minimise the risk of the ‘autotune sound’ being obvious for the crowd to hear, when either a note is sang wrong, due to automated pitch correction to the wrong note. Therefore, having this further element of control is a huge help. The Art Autotune device also comes with the ability to save 5 vocal presets, which can be switched between via a foot-switch, this means that you can easily change the settings on-stage, with the press of a foot switch, it’s a fantastic live autotune unit. In our opinion, it isnt so much about finding the best autotune pedal, but the most suited auto tune pedal for you. As we’ve discussed in the article, each one has their own advantages and disadvantages which need to be considered before making the final purchase.